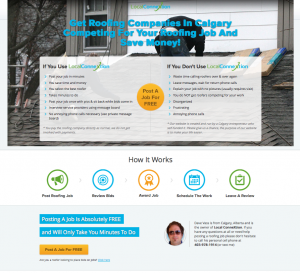 Anytime you’re in the market for a Calgary roofer, you’re probably going to look for reviews on Google or another site like Yellow Pages or Yelp. This can be an effective way to learn what people are saying about local contractors, like Hubbard Roofing & Exteriors, but it is not the only way. Reviews have become more reliable as Google has taken measures to prevent fraudulent ratings from coming in, but sometimes the wording of reviews can be too general to get real information about the company. If you are having issues with your roof and would like some personal attention, you can submit your job to Local ConneXtion and have roofing companies bid on your job, detailing their price point and the approach they would take with your job in specific. It’s a way of streamlining the process of finding a contractor, and it usually results in a better fit between contractor and client. It’s free, and could be a good fit for you.